Dear Readers, it has been such a task trying to decide on the Wednesday Weed for this week. I wanted to find a plant here in the Alps that we also have in the UK, even if not necessarily in East Finchley. 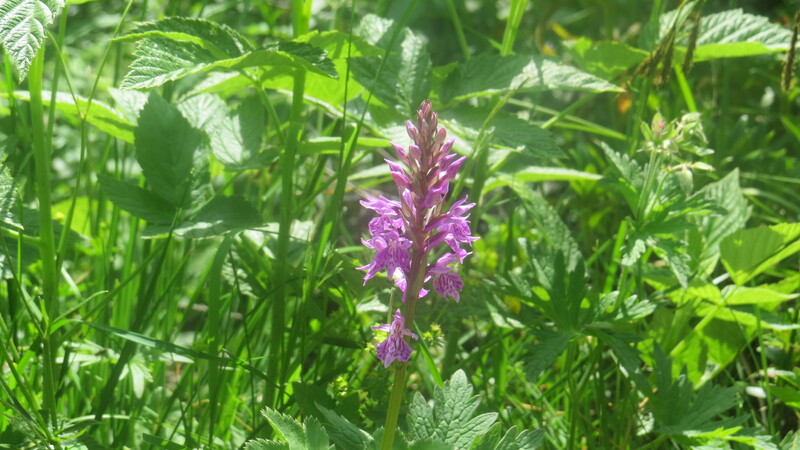 After a lot of deliberation, I have settled on the Spotted Heath Orchid, because it is very common around these parts, but you would look for a long time to find it in Britain, and there are some very interesting reasons for this. When I think of orchids, I tend to think of the waxy blooms of the Phalaenopsis orchids that are for sale in every supermarket and florist, but the orchid family is much more varied than this. Tropical orchids tend to be epiphytes – that is, they grow on the branches of trees and other plants. 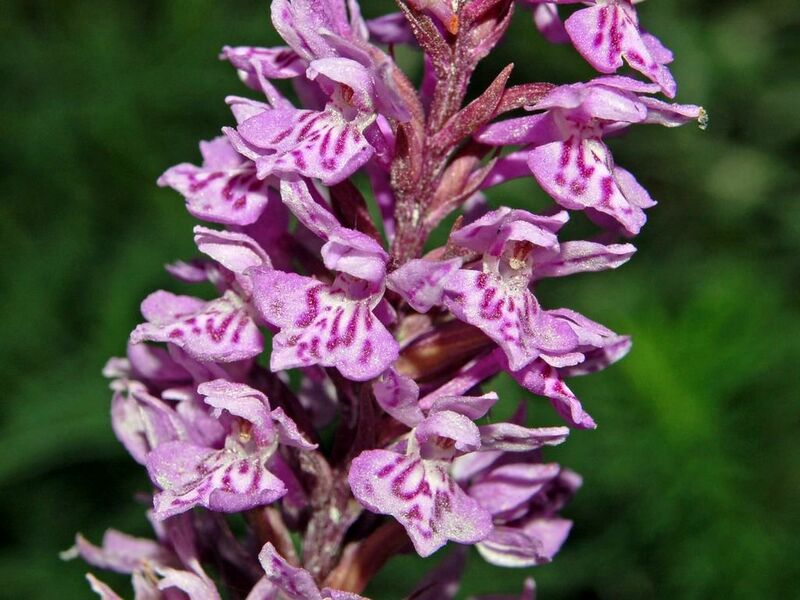 Most European orchids are terrestrial, growing from tubers (the generic name Dactylorhiza means ‘finger root’), and these roots produce new stems and flowers every year. Hence, they tend to grow in places which may be mown, but where the soil is not ploughed or otherwise disrupted. The root is interesting because different parts play different roles. One part supplies the stem with the materials that it needs to produce the flower and seeds, while the other part conserves the elements required for next year’s plant. However, the flower is only fertile if the orchid is in relationship with some very interesting fungi. We are only just beginning to understand the interplay between some kinds of fungi (called mycorrhiza) and plants, but this is an ancient relationship which influences many elements of a plant’s success. 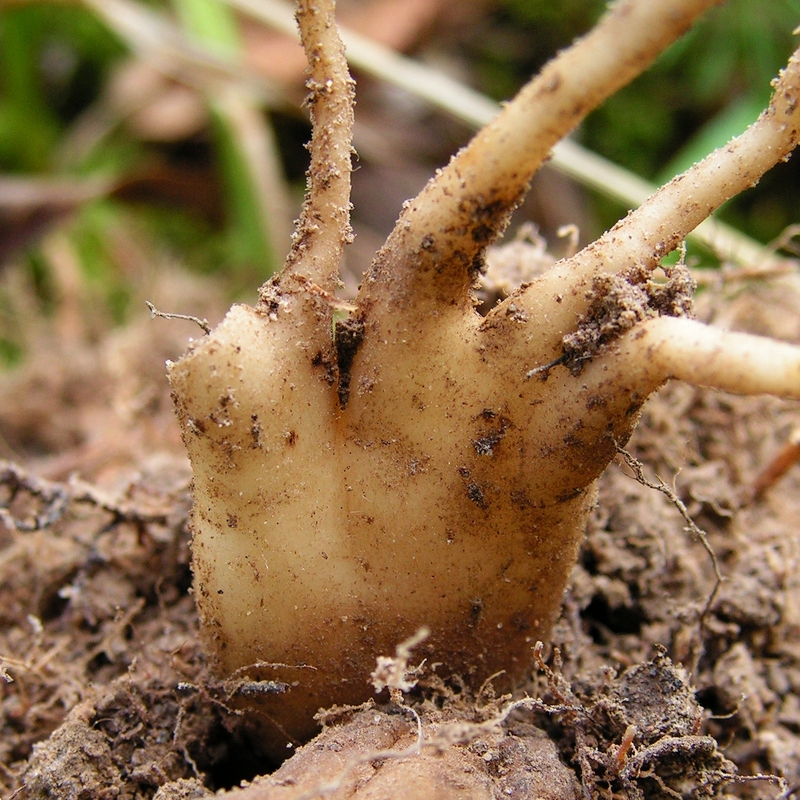 The mycorrhiza may intertwine with the plant’s own roots or even grow within them, extending their area and making the uptake of water and certain minerals much easier. In return, the fungi have access to the sugars that the plants produce. This kind of ‘deal’ between two different kinds of organisms is known as ‘mutualistic’ or symbiotic. It is vital for the health of soils, and is, of course, yet another element which is disrupted when we blast fields with chemicals, particularly fungicides. 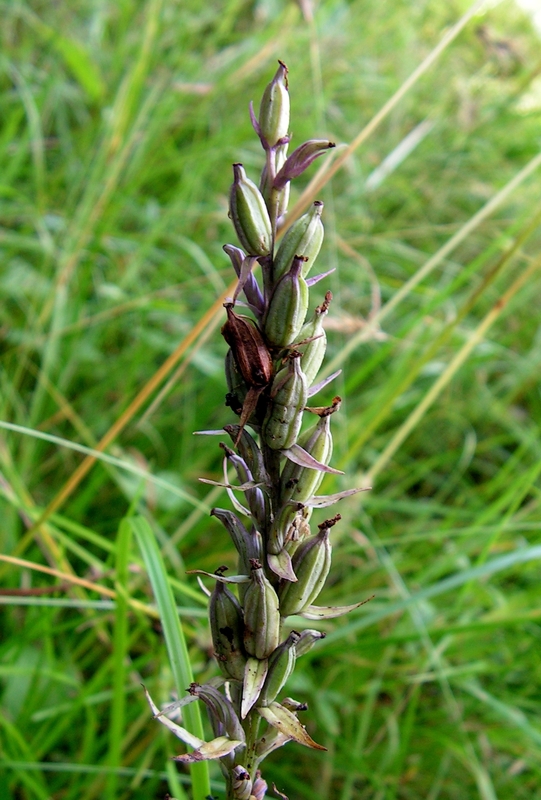 Where the Spotted Heath Orchid has access to the mycorrhizal fungi, it may produce seeds. The plants are hermaphrodite and are pollinated by bumblebees. My Field Guide to the Flowers of the Alps mentions that this plant is found in ‘unfertilised’ meadows and pastures – fertilizer disrupts both the balance of plants in a grassland, and the soil ecology, including the fungi. 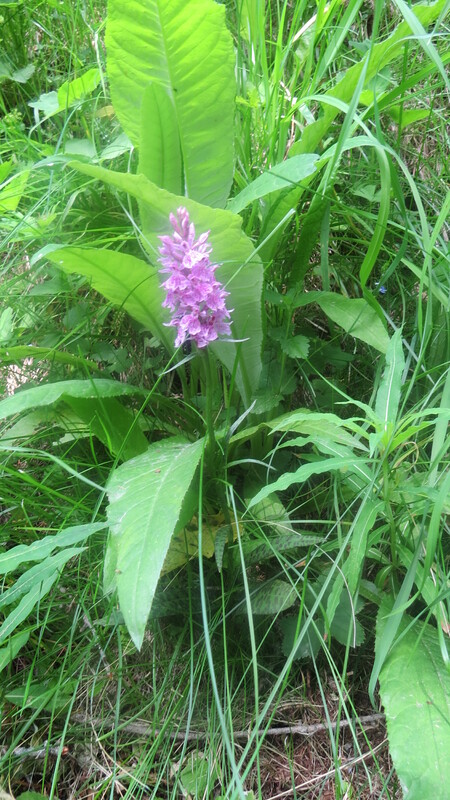 I found this particular plant growing beside one of the glacial streams, where it would be regularly flooded and where the soil is damp, and this is another requirement for the plant to flourish. It would once, I’m sure, have been common in our water meadows, but then, according to Historic England’s pamphlet on conserving such environments, we have lost over 90% of our grassland in lowland areas, and long-standing water meadows are vanishingly rare. Here in Austria, Orchids are common enough for no one to comment on them, and I hope to find some more examples for you later in the holiday. In England, you are as likely to find an unfertilised, unploughed, damp grassland with no biocide use as you are to find a golden eagle. Having said which, I can think of one such meadow along by the river in Oxford, which has never been meddled with. The variety of plants and insects there would rival that of Obergurgl. Some days, I could weep for what we have lost in the name of profit and production. But still, this plant is thriving here in the Alps, and is found in mountainous areas of Europe as far east as Siberia. It has a wide range of common names – according to the Plant Lives website, they include Curlie-Daddie, Dandy Goslings, Queen’s Finger and Crow’s Flower. 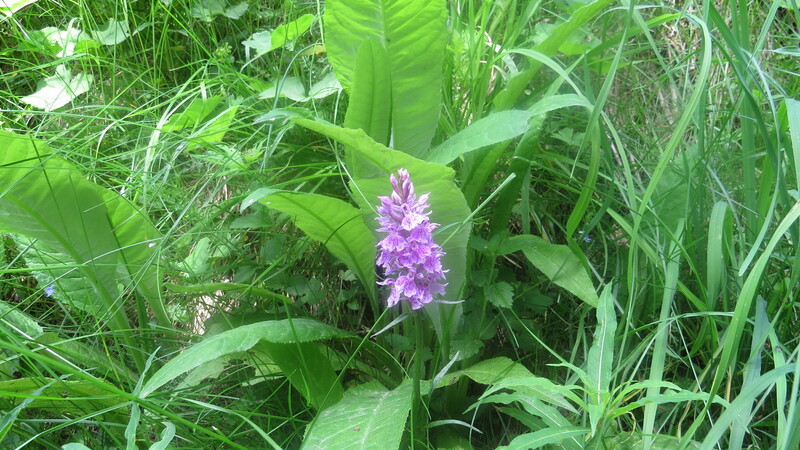 This would suggest a rich harvest of folklore and medicinal uses for the Heath Spotted Orchid, but so far I have only found one tale, from Hungary (courtesy of Plant Lives). As usual, it was for a love potion. The roots of the plant needed to be dug up on Midsummer Eve, dried, and mixed with menstrual blood. The mixture should then be sprinkled on the food of the reluctant lover, in order to turn him or her into a besotted swain. I can only imagine how delighted they would be when they discovered what they’d been eating. This entry was posted in Bugwoman on Location on July 8, 2015 by Bug Woman.